I had my first Alechemy beer at The Lamb on Holloway Road, and it was the awesome Rye O’Rye. It was a bona fide face-changer and ever since I’ve been hoping to see it again. Alas I haven’t seen any Alechemy beers at all in London. Until today, when I popped into my local Oddbins, which has recently received a shipment from Scotia, Caledonia. Eh, Livingston to be precise. Oddbins in Crouch End is great – it has a dazzling array of beers and they often throw you a curve ball. My eyes lit up when I saw the aesthetically pleasing Alechemy insignia, and I anxiously searched for the aforementioned rye beer. Alas my search was in vain but I did pick up Alechemy’s Almighty MOFO IPA and boy am I glad I did. I stopped by a nearby pub en route to the offiie and had a bottle of Macro Glory Juice Goose Island IPA, and this DIPA from Alechemy resembles GIIPA (that’s what I’m calling it from now on). With a firm malt backbone, distinctive caramel and a hop punch that’s like being slapped about the chops, it’s a winner. Stupidly I popped it early; I was planning to drink tonight’s haul in an upwards ABV scale but never mind, I can deal with that. If you are anywhere near north London I’d make a point of getting to Oddbins and grabbing a bottle of this. 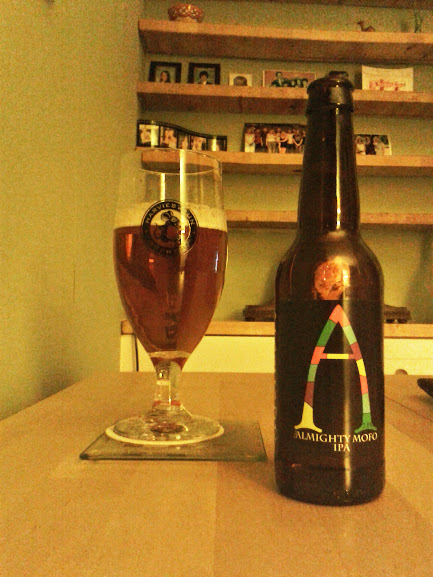 This entry was posted in Beers and tagged Alrechemy Brewing Co., Craft Beer, Crouch End, Oddbins. Bookmark the permalink. I live in the north east of england mate I so want an oddbins up here. Nice review. I’ll keep an eye out for it. Thanks, definitely worth looking out for. Craft Beer Calling looked great, did you make it? It looks great every time. My wife and I are forever saying we’re going but so far for whatever reason we never make it. One day though it will get crossed off my to do list. I may try to get up myself next year.